Jeff Cable's Blog: High winds wreak havoc at the Olympics! 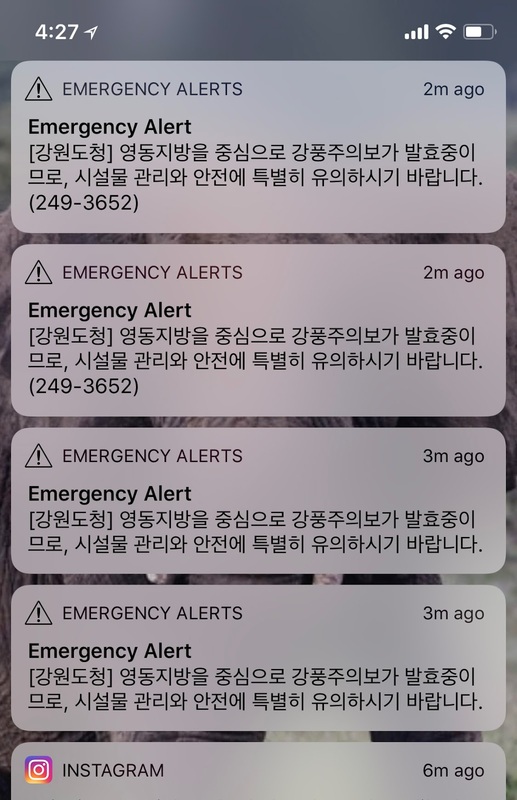 I was on a press bus this afternoon when my iPhone along with everyone else's phones start beeping with these Emergency Alerts. I looked at my phone and, of course, had no idea what the heck these say. It wasn't until an hour later that I heard that there were gale force winds down in the Gangnneung area. This where I am living and where most of the ice rinks are located. I was up in the mountains (where you would think the winds would be worse) and things weren't too bad. I did see all these security people mobilizing but not sure if this was the reason. I had seen the reports of high winds wreaking havoc on the snowboarders and other competitions, but did not think that it would effect the coastal areas. We were driving over a bridge and the winds were so strong that the bus was swaying from side to side. At one point, the guy next to me on the window seat pointed out that part of the bus was blowing off. Sure enough, the driver had to pull over on the freeway and fasten down a metal panel on the side of the bus. I got off the press bus around 6pm and started walking back to my apartment, to get cleaned up before tonight's hockey game. The winds were so strong that I had to fight just to walk. One of my roommates literally saw a lady get blown off of her feet, falling and hitting her head. As I walked towards my building, I saw this sign (amongst many) that had blown over. I walked past it, thinking that it was just a sign in the ground and not much more than that. But as I past it, I looked back and noticed the bent metal post. That is strong winds! And then as I was heading to the rink just now, I saw that the fence outside our building was blown so hard that it uprooted the cement posts. 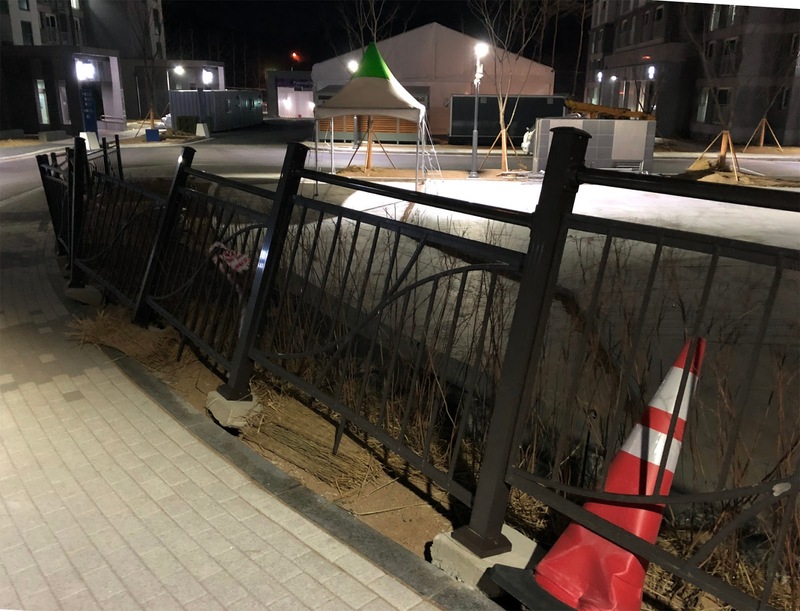 As you can see from the photo, and the previous blog post showing behind-the-scenes of the Olympics, most of the temporary structures are tents. The tents in this photo are fine, but the cafeteria tent by our building is now closed and almost all the security checkpoints are now blown down. 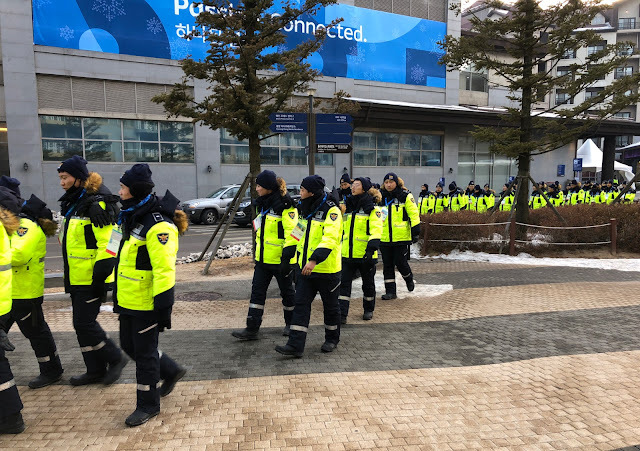 They are functioning without cover or power, but they are still checking credentials and doing their jobs. I am sitting in the media tent at the hockey rink (which was evacuated due to the winds) and the nice gentleman next to me showed me this video. Crazy stuff - but the show goes on! What is your favorite sport to photograph at the Olympics? You being a SJ Sharks fan and shooter, I assume hockey.